2018 Irish Open champion Russell Knox will defend his title at Lahinch in July. The Scotsman, 33, defeated Ryan Knox in a dramatic play-off to win the tournament at Ballyliffin last year. "That win was a moment I'll remember for the rest of my life, just one of those great days in my career which I'll always look back on," he said. "It will be nice to go back and enjoy my title defence and hopefully challenge for the title again." Knox, ranked 65th in the world, earned almost £890,000 from the win which moved him up to fifth in the Race to Dubai standings. 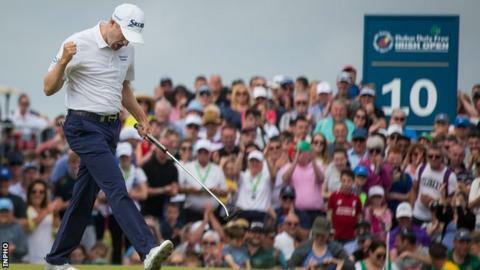 He will face stiff competition for this year's title with major winners including Louis Oosthuizen, Danny Willett and Padraig Harrington joining Ryder Cup winners Lee Westwood and Tommy Fleetwood at the County Clare course. "The Irish fans were so supportive of me and I'm glad I could give something back with the drama at the 18th hole," said Knox of last year's win, which was sealed in the first hole of the play-off. The event will take place just two weeks before the Open Championship gets underway at Royal Portrush.